Stryy is located in Western Ukraine (formerly Eastern Galicia) about 40 miles (65 kilometers) south of L'viv. To view a map of the area on Google Maps, click here. Variants on its spelling include Stryj (Polish), Stryi, Stryia, and Stry. Throughout this page the "official" JewishGen spelling of "Stryy" will be used, unless a different spelling is used in a specific document title. Stryy was first populated by Jews in the late 1500's. The first synagogue was built in 1660. 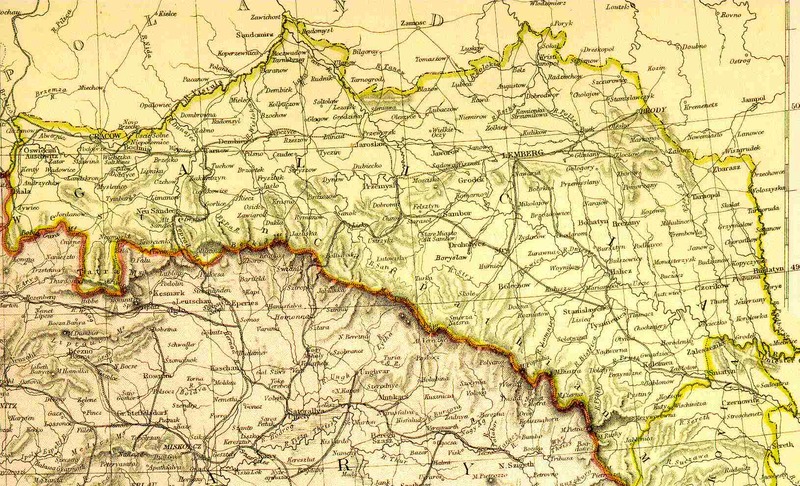 After Poland was partitioned, Stryy became part of the Austrian Empire in 1772, at which time there were about 440 Jewish families in the town and suburbs. After World War I, Stryy was part of the area that became a free and sovereign Poland. The town had a Jewish population s 10,988 in 1921 and about 12,000 in 1939. The Germans occupied Stryy on July 2, 1941, and hundreds of Jews were immediately killed. In November 1941, 1,200 Jews were shot in the Holobotow forest. Several depotations to extermination camps took place beginning in September, 1942. Between June and August of 1943 the Stryy ghetto and labor camps near the town were liquidated. When the Soviet army occupied Stryy in August, 1944 there were only a few Jewish survivors. No Jewish community was re-established. Until 2001, no memorial had been established to commemorate the thousands who were killed at Hobotlow. Due to the generosity of Prof. Adam Zielinski, a former resident of Stryy, a memorial has been placed at the spot. In 2006, Dr. Zielinski arranged for improvements to the monument. A detailed article describing the placement of the memorial can be viewed at "Memorial to the Martyrs of Holobotow". More historical information about Stryy can be found in the section A History of Stryy, from the book Chasydzi of The Past: The Story of Stanislawowsko-Kolomyjsko-Stryjska Lands, by Kamil Baranski. A History of Stryy, from the book Chasydzi of The Past: The Story of Stanislawowsko-Kolomyjsko-Stryjska Lands, by Kamil Baranski. Indexing of 19th Century Stryy Vital Records--AGAD Archives Project--Status report on indexing project and fundraising efforts. Photographs and Location information for Monuments and Historical Sites in Stryy -- information provided by Amos Sobel of Haifa, Israel. Translation from "The Protective Police War Criminals of Stryj tried by the People's Court"
Gesher Galicia--the special interest group (SIG) for those with Jewish roots in the former Austrian-ruled province of Galicia. Encyclopedia Judaica (Jerusalem: Keter Publishing, 1971), s.v. "Stry"